How does the biblical, young universe explain distant starlight? This has been an argument that has been thrown at Creationists for a very long time. Evolutionists and skeptics believe we are at a stand still at this question; are we? Absolutely not! First of all, what does the distant starlight mean and how is it a problem for those who believe in a God-made world? Did this light really take millions of years to get here? The distant starlight problem for Creationists goes like this: there are stars and galaxies billions of light-years away and since we see their light the universe must be billion of years old for the light to have reached us. This question definitely stumps some Bible-believing Christians and sometimes they crumble under the argument, giving a foothold for Satan to degrade Christianity! We need to know the answer for this statement! Well, before we address these theories we may ask ourselves “Why did God make all the universe so far away?” But there is a very good reason He did exactly what He did! 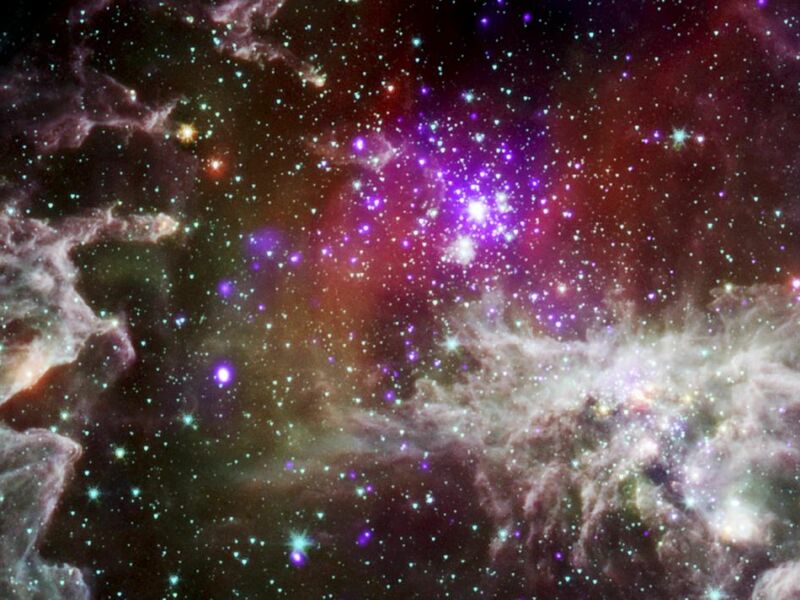 Imagine if God had created all the heavenly bodies within 1,000 light-years away! Wait, you couldn’t imagine that, you wouldn’t even exist! You see, our entire galaxy is about 100,000 light-years wide and most nebula, stars and other singular objects (not galaxies) that we can see exist in the Milky Way. So, if we were to condense all the stars, nebula, galaxies, etc. within 1,000 light-years then you would have galaxies colliding into us constantly. You would have stars and hot and radiating wind tearing the sun and all the planets apart. You would also be grasping at millions of stars, destroying our solar system! OK, we see what a catastrophe that would be! But what about heavenly bodies within 6,000 light-years away? You would have many of the same problems! See, if God had designed it any differently then we would have no hope for life! For one, I’m glad God made it like He did! The Gravitational Well theory is still a theory in the making but it also has some strong arguments. Time goes slower when closer to gravity (fact). A lightyear is 5,878,499,814,210 miles and takes a trip of one year (fact). If earth were in a “gravity well” then light would travel the same speed but time would go slower (example: a lightyear travels the same distance but in less time, let’s say a day)(theory). Even if we were in a deep gravity well it would still take a long time for light to get here. For example if you have the Bubble nebulae’s light coming here doing 5,878,499,814,210 miles per day you still have to wait 72 million days (197,125 and 1/4 years) for the light to get here! The gravity of this “well” would have to be so great it would probably crush the world! Let’s imagine for a moment that earth has a gravity of 1.0G (G=Gravity) and every .1G changes the time one second every ten minutes (which is very exaggerated). For example if you started at 12 A.M. with the gravity 1.1G then by 6:00 A.M. (normal, 1.0G time) you would be at 5:59:24 A.M. But, with the gravity 16.0G (starting at 12 A.M.) you would be at 4:36 A.M. by 6:00 A.M. normal, 1.0G time. And if we were to expand this to year settings you would be a little over 85 and 1/4 days behind! But, if we were to further this all the way to the Bubble nebula it would only be the difference of 16,801,149 years of 72 million! So, if the “gravity well” we might be in is 16.0G it would mean that the light from the Bubble nebula would get to us in 55,198,851 instead of 72,000,000 years! But if if the gravity well was 60G light would arrive here instantaneously (even though it may travel billions of light-years) because each day would constantly be taken over by the slowness of time due to the gravity! Also, this gravity would have to affect the entire universe in order for light to move instantaneously. But if we had 60G the world would probably be crushed. It is possible, though, that this could be an acceptable theory. Further research will lend more information. The following theory is quite popular. We might say that the above theory actually makes sense but we find a different account in the Scriptures. God tells us that He made the galaxies on the fourth day, not billions of years ago. Well, the this theory is a lot like the other one but it has a different approach. This theory might sound pretty good but then, once again, we read the Scriptures and find a different story. You see, God created light on the first day and then the galaxies and stars on day four, not thousands/millions/billions of years apart. When we think of the distant starlight “problem” we might try to imagine God calling creation into being, or we might think how the big bang explains everything. Whether you believe the latter or the former I strongly suggest you read the following theory with great attention. Now, I know you have that image of God speaking light into existence and the light coming from His mouth but that doesn’t hold up to the Bible. We find that God said “Let there be light” and there was light. It never says that the light came from God’s mouth or that it has a starting, physical point. We find that the word used for “Let there be” is the Hebrew word hayah. And we find this amazing word in Exodus 3:14. Read this verse that supports this theory so well. And when we look into the use of I AM we find that God is referring to His unlimited power in everything (for further research go to “I Am” God’s Unlimited Power). It sure is amazing that He used the same word to describe the entering of light. See, the whole point of this theory is that when God created light it did not have a starting, physical point, nor an ending, physical point, it just goes on forever. In short, when God said “Let there be light” the entire universe was filled with light because, in a way, the starting point of light was everywhere. Then, when God made the stars the already created light would be at earth and coming from the stars at the same time. Thus giving us perfect, timely visions of these stars, galaxies, etc. The thing is that we need to remember about the creation of the world is that God made light first then He made the stars, galaxies, etc. This an important point to keep when discussing the distant starlight issue. But, however God did it isn’t really the big issue. The true reason these skeptics question the Bible because of their corrupted souls. They have rejected God and will not turn to Him. If you can convince them of their sin and cut a clear path to Jesus Christ, the Salvation of mankind, you will find these issues fade away. Although, Creation by God is essential to the Gospel!